The conventional wisdom among many affordable housing advocates is that boosting the supply of market-rent housing won’t help low-income earners. They argue that most new housing built in Australia is too expensive for low- and middle-income earners. They believe that building more homes won’t lower the rents paid by the poorest Australians unless they’re explicitly built to house them. This conventional wisdom is wrong. 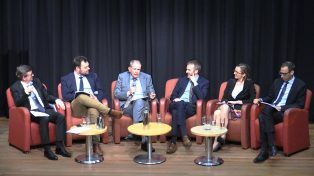 Recent Australian research claiming that most new housing built in Australia is targeted at the top end of the market is flawed because it groups price deciles by the number of Local Government Areas, rather than by the number of dwellings. And claims that more housing doesn’t help low-income earners are at odds with international literature showing that market-rent housing remains the largest source of affordable housing for low-income earners. This matters, because many people are using the recent research to argue that governments should focus on increasing the subsidies for affordable housing rather than tackling politically difficult planning reforms. This would be misguided policy, based on misguided analysis. To support this conclusion they present analysis of building approvals in each local government area in Australia. 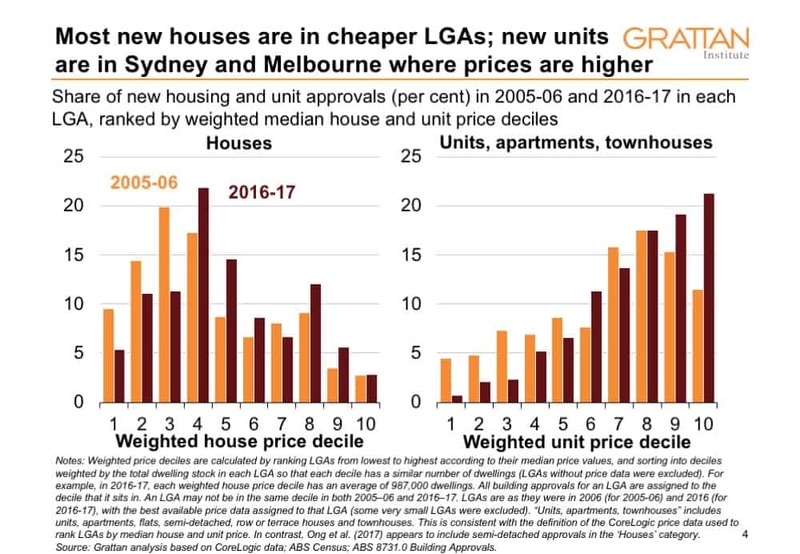 They count the number of new housing and apartment approvals made in each of 2005–06 and 2013–14 in each LGA, and then rank LGAs from lowest to highest according to the real median prices of houses and apartments. They then divide the LGAs into ten groups (or deciles), each containing the same number of LGAs. The authors find that over the past decade almost 90 per cent of houses and 95 per cent of units were built in the 50 per cent of LGAs with more expensive housing. By contrast, less than 5 per cent of new homes were built in the 20 per cent of LGAs with the cheapest housing. They conclude that most new housing has been supplied at mid-to-high prices relative to the existing stock, and that this effect has become more pronounced between 2006 and 2014. The critical flaw is that when they group LGAs into deciles, the authors fail to weight the LGAs by the existing number of dwellings in each. This is more than a rounding error, because LGAs have very different populations, ranging from sixty-two people in Maralinga Tjarutja in far-west South Australia to 1,184,215 in the LGA covered by Brisbane City Council. 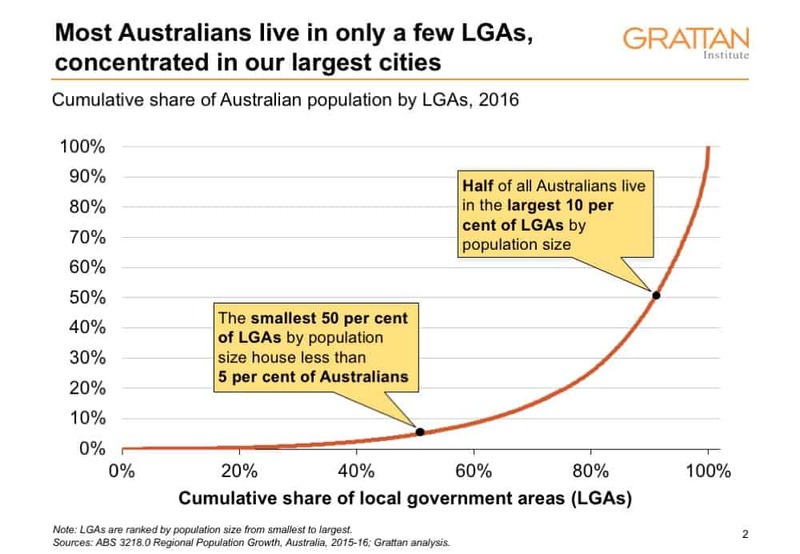 While just 5 per cent of Australians live in the smallest half of all LGAs, half of all Australians live in the 10 per cent of LGAs with the largest populations — all of which are in or close to our major cities. 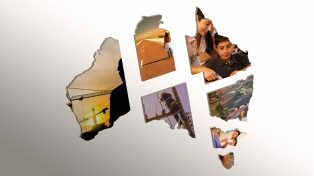 Small LGAs are not randomly distributed around Australia. Most LGAs with small populations are in rural and regional areas. With relatively few jobs being created there, these aren’t the places where we would expect much new housing. 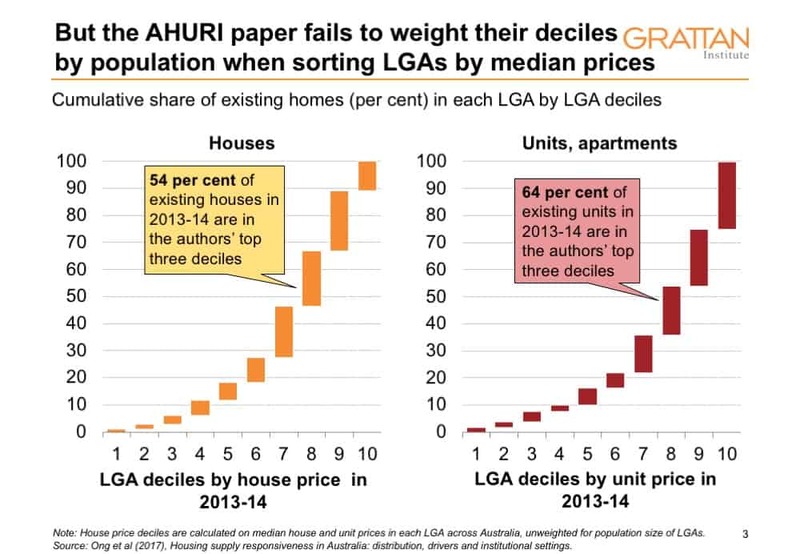 According to the AHURI analysis, LGAs in the bottom six deciles according to median house price covered just 28 per cent of all houses in 2013–14. By contrast, the LGAs in the top three house price deciles — almost all of which are in or close to capital cities — account for 54 per cent of the existing housing stock. It is hardly surprising that most new housing is built in the top three LGA deciles — they already house most of the population. These LGAs represent the vast bulk of Australia’s major cities, where population and jobs are growing faster than regional areas. 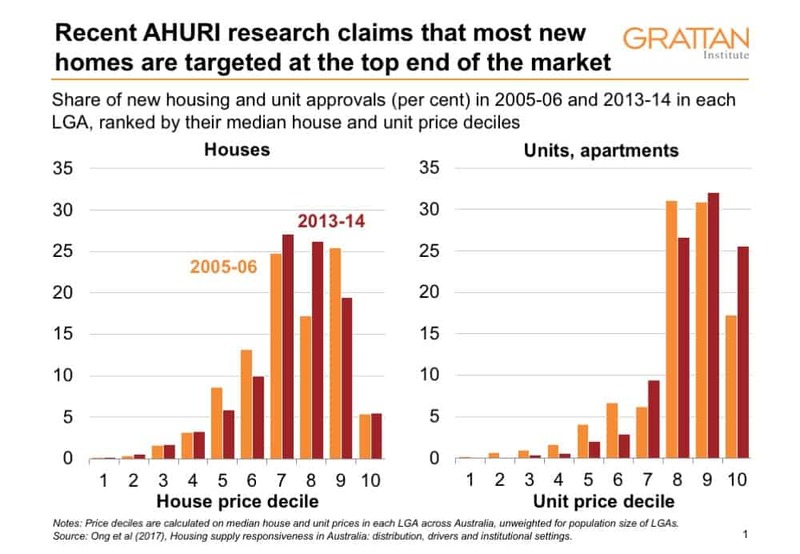 And so it is misleading to conclude that new housing has been disproportionately built to serve the top end of the market. The skew in the analysis introduces significant distortions. A suburb with the same median house price as Australia overall ($571,000 in October 2014) would not fall in the authors’ middle LGA decile, as you might expect it to, but in the ninth LGA decile. The Australia-wide median apartment price — $490,000 — would sit in the authors’ highest LGA decile. No Australian capital city has a median house price within the bottom half of LGA deciles by median house price. And only Hobart has a median unit price that would fall in the bottom half of LGAs by median unit price. Our new analysis of the data, updated to 2016–17, shows that two-thirds of new houses have been built in the cheapest half of all suburbs, and most new units and apartments have been built in Sydney and Melbourne, where median prices are higher. The chart below creates weighted price deciles for houses and units, so that each price decile has approximately the same number of dwellings (according to 2006 and 2016 Census data). In 2016–17, almost half of the new houses were built in the third, fourth and fifth price deciles, where the median price ranges from $343,000 to $541,000. This is a typical price for a new house and land package in new greenfield suburbs on the edges of our major cities, and includes LGAs such as Casey, Wyndham and Melton in Victoria, Moreton Bay and Redlands in Queensland, and Swan and Wanneroo in Western Australia. Because Sydney’s fringe LGAs (such as Campbelltown and the Central Coast) are more expensive, they sit in the sixth decile. And whereas the authors claim that less than 1 per cent of new homes were in the cheapest 20 per cent of suburbs in 2013–14, we found that 16 per cent of houses were in the cheapest suburbs. We also detected only a small change in this supply pattern between 2005–06 and 2016–17. Not surprisingly, new units and apartments tend to be built in more expensive LGAs. Sydney, where median dwelling prices are highest, has seen a construction boom in recent years: about 85,000 new apartments have been built in the past four years, including 60,000 in inner and middle-ring suburbs. And these apartments aren’t just being built in high-end suburbs: new apartments in LGAs like Parramatta, Penrith and Liverpool are still in the eighth and ninth unit-price deciles nationally. In Melbourne and Brisbane, many new apartments are being built in LGAs in the seventh and eighth deciles. Across Australia, less than 60 per cent of apartments and townhouses were built in the LGAs in the eighth nonth and tenth price deciles (compared to 84 per cent in the original AHURI calculations for 2013–14). New housing should be disproportionately located in suburbs that are more attractive (both in access to jobs and quality of life). And precisely because they are more attractive, such areas are likely to be more expensive. It would not be good to disproportionately build housing in LGAs with the lowest median house prices — typically rural and regional areas or fringe suburbs of our major cities — where job prospects are often poor. The fact that units and apartments are mostly being built in established desirable suburbs is good for affordability: units and apartments are generally cheaper than existing detached housing, so this makes housing in those suburbs more affordable overall. Of course, new housing needn’t be targeted at lower price points to improve overall housing affordability. More housing supply — even at the top end — should ultimately free up less expensive housing stock. The people who move into newly constructed, more expensive housing are either existing residents who move out of less expensive housing, or new residents who would otherwise have added to the demand and pushed up the price for existing housing. Irrespective of its cost, each additional dwelling adds to total supply, which ultimately affects affordability for all homebuyers. Other studies reach similar conclusions. 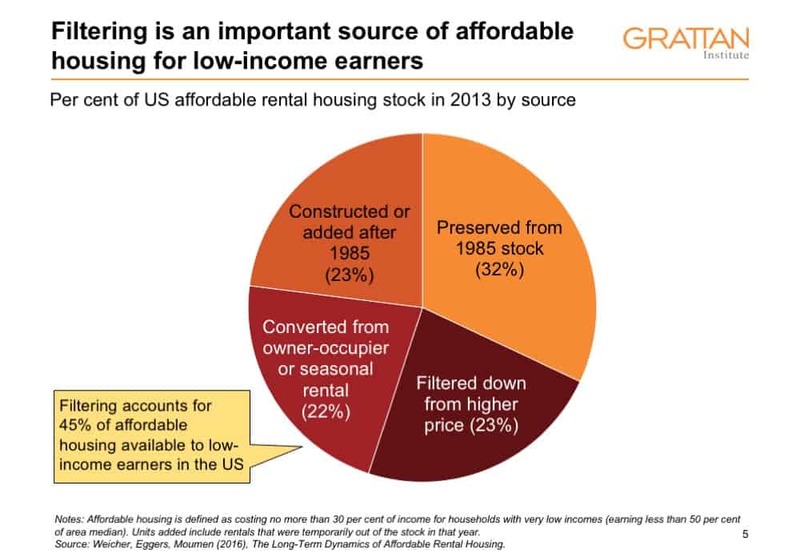 Data from the American Housing Survey show that 45 per cent of homes that were affordable to very low-income earners in in 2013 had filtered down from owner-occupier or higher rent categories in 1985. Expensive homes gradually became cheaper as they aged, and were sold or rented to people with more modest incomes. Without those extra homes, far less affordable housing would have been available to low-income earners. Unfortunately, there is little Australian literature on filtering. Australia lacks an equivalent to the American Housing Survey, which has tracked a consistent set of homes, and the characteristics of those who live in them, every two years since 1985. The last dedicated survey of the Australian housing stock was conducted almost two decades ago. Nor do we know what happens to particular homes over time. But it’s a fair bet that market-rent housing is an important source of affordable housing here, as it is in the United States. Of course, new expensive housing might not improve the balance between supply and demand if it merely induces additional demand, presumably from overseas purchasers. But there is little evidence that overseas purchasers are increasing demand by much more than they increase supply. There is clear evidence that they are not the only purchasers of more expensive housing. And while gentrification can push up prices in a particular area, the construction of more housing in total should lead to prices lower than otherwise. These studies underscore the importance of more housing supply to keep housing affordable for low-income earners — even if much of the new housing is too expensive for them. Previous Grattan Institute research shows that worsening housing affordability is hurting low-income earners the most. Those at the bottom of the income spectrum are much less likely to own their own home than in the past, are often spending more of their income on rent, and are more likely to be living a long way from where most new jobs are being created. Until recently, the supply of new homes in Australia wasn’t keeping pace with demand. Planning rules and practices made it reasonably easy to build apartments in the CBD and to develop new housing estates on the city fringe. But they made it relatively difficult to redevelop the inner and middle-ring suburbs of major cities, where many people would prefer to live because they would have better access to jobs. Overall population growth outstripped housing growth. Not surprisingly, house prices rose. Development in middle suburbs has increased in recent years, especially in Sydney. But development at today’s record rates is the bare minimum needed to meet Sydney and Melbourne’s housing supply targets over the next forty years, given that population growth is back up towards record levels. While more market housing can make housing more affordable for all Australians, including many low-income earners, some level of subsidies will always be required for the worst-off Australians. The social housing stock has not kept pace with population growth. The stock of social housing — currently around 400,000 dwellings — has barely grown in twenty years, whereas Australia’s population has increased by 33 per cent over the same period. Social housing as a proportion of the housing stock peaked in about 1997, and has fallen from about 5.6 per cent to 4.8 per cent over fifteen years. But the public subsidies required to make a real difference to the supply of social housing would be large: boosting the stock of social housing by 100,000 dwellings — broadly sufficient to return the total affordable housing stock to its historical share of the total housing stock — would require additional public funding of around $900 million each and every year. Even then, it would still house less than a third of the bottom 20 per cent of households. Increased rent assistance would be a fairer way to help low-income renters. No low-income renter would get a lot of support, but everyone would get a little help. Rent assistance is based on recipients’ rent levels, the payment can be well-targeted to need, and the support can move with people when they move homes. That’s why the Henry Tax Review instead recommended that rent assistance be increased to a level “sufficient to support access to an adequate level of housing.” But even a $500-a-year boost to rent assistance would cost the budget $700 million a year, and a larger boost is probably warranted. Inclusionary zoning could provide more affordable housing at no direct cost to government budgets. But inclusionary zoning is not cost-free. It may increase rents in the private rental market a little, which would mean that people are allocated affordable housing would be much better off but other low-income earners could be a little worse off. In practice, no plausible amount of public funding can shield low-income earners from rising housing costs. But making housing cheaper overall will reduce the amount of public subsidy needed to bridge the gap between development costs and what low-income earners can afford to pay. Even better, boosting housing supply doesn’t cost the taxpayer anything. Housing supply isn’t the only solution to make housing more affordable for low-income earners. Larger subsidies are needed to help low-income earners cope with rising housing costs. But without more supply for everyone, housing won’t become much more affordable, especially for low-income earners. Curbing finance might make housing cheaper, but would it make us better off?